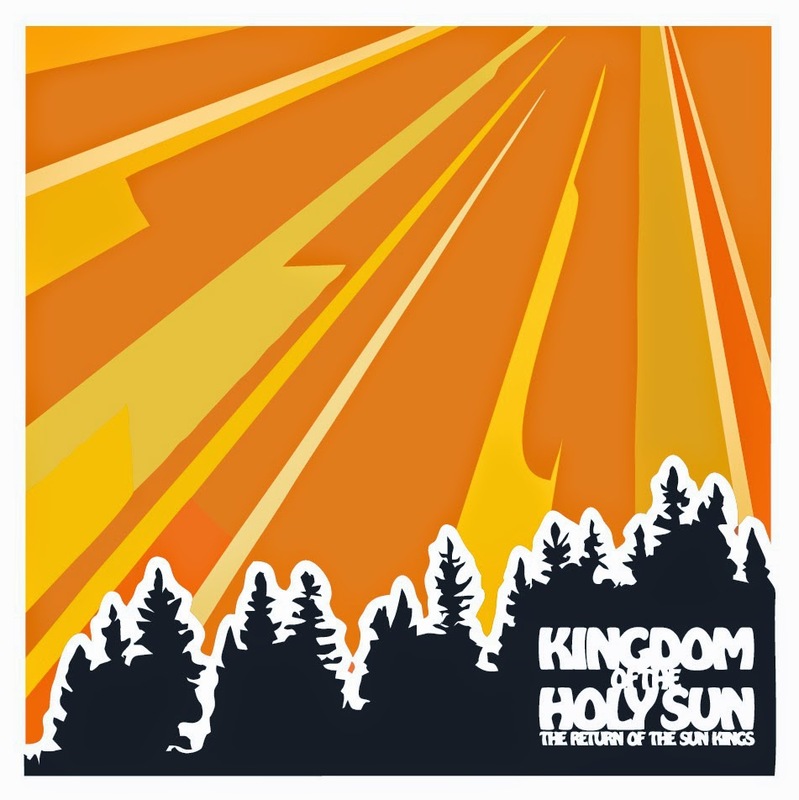 ♬Liner Notes♬: After sifting and sorting through some of the week's best new music, I think we've got a catchy & cool mix of sounds from Kingdom of the Holy Sun, The Go! Team, Ivan & Alyosha, Steve Earle, THEESatisfaction, Josh Rouse and tons more... Let's PumpUpThaVolume while we're "Getting Higher"! Notes: "Late last year we learned that the Go! Team would be returning with a new album in 2015. Now we know that [the Brighton UK band's fourth long-player and] first album in four years is coming this March and is called The Scene Between. The brightly cheery, sample-heavy title track sounds like prime Go! Team, which might be because band leader Ian Parton recorded it on his own as with 2004 debut Thunder! Lightning! Strike!" Love this gang, welcome back! Notes: "Seattle band Ivan & Alyosha announced their sophomore album It’s All Just Pretend, an 11-song release that will be the band’s follow-up to 2013’s All The Times We Had. Produced by Joe Chiccarelli (U2, My Morning Jacket... Morrissey), Ryan Carbary and Chad Copelin, It’s All Just Pretend will be released in May, but in the meantime the five-piece has shared the album’s first single, “All This Wandering Around.”... The song stands out from the very opening notes, but its message is as captivating as its melody." We haven't heard I&A on PUTV for a couple years, but they're back with a new album tease that sounds like a hit! Notes: "Referring to their music as Psychedelic Shamanistic Madness, Seattle’s Kingdom of the Holy Sun have carved out a sound steeped in vintage garage sensibility. Building upon their past releases, with The Return of the Sun Kings, the band has achieved a uniquely rich organic connection with each instrument an essential ingredient in achieving a majestic internal coherence. Today’s featured song, “Getting Higher”, is the album’s midpoint and a full-bodied THC-induced workout. Carried rhythmically with its head nodding backbeat, the track quickly opens up to a wall of tasty phychedelic sound, dipped in a drastic elements while keeping a consistent melodic heart." We heard "Thirteen Eyes" from KotHS last August on Episode122. Notes: "The Seattle duo The Grizzled Mighty couldn’t have christened themselves with a more appropriate moniker – their gruff, ferocious rock is nothing short of a ravaging force of nature... The opening track on [sophomore album] Closed Knuckle Jaw, “Chantael” aims for the jugular with relentless performances from both musicians... Hot off their album release show at Neumos...The Grizzled Mighty will play at the Bunk Bar in Portland on February 28th..." (That's like tonight...) We first heard from the Grizzled Mighty on our third episode back in April 2012! Notes: "[Costa Mesa, CA's] The Growlers are fundamentally anti-pop. For one, Brooks Nielsen’s listless, drunken drawl reflects the doldrums of modern life... The title track, for one, includes a funky arrangement that bridges the dichotomy of a modern digital hellhole with Nielsen’s desire to return to the old school — back when the internet wasn’t quite “bigger than Jesus and John Lennon.” It almost sounds like a sonic experiment the Doors would have tried had Morrison made it past L.A. Woman and into the disco era." We rocked the Growlers two years ago back on Episode041. Notes: "Tate Mayeux and Brian Broussard first teamed up in a metal band, but a Hayes Carll show made Mayeux reach for his country roots again. Growing up in the [Texas] Hill Country, he soaked up plenty of country music with a cosmic twist. Broussard came from Port Arthur – home to George Jones, Janis Joplin, and Johnny Winter–and as a songwriting pair, the two perfectly reflect their respective Texas upbringings.... “Stoned And Broke Down” isn’t quite a tears-in-your-beer sentiment, but then again, Mayeux & Broussard are a different breed of country band." "You Walked Through the Door"
Notes: "With eight of his albums receiving four stars or higher, [AllMusic] reviewers haven't been shy about their appreciation for Nebraska-born, Spain-based indie singer/songwriter Josh Rouse, so we're definitely pleased to debut "You Walked Through the Door." The easygoing track, featuring acoustic guitar, shuffling drums and Rouse's direct, unaffected vocal delivery, comes from his upcoming album, The Embers of Time, set for release on April 7." We heard "Simple Pleasure" from Mr. Rouse back in April 2013 on Episode056. Notes: "After signing to ANTI- earlier this year, Pennsylvania punks Title Fight are set to release their third full-length, Hyperview, in February. First single “Chlorine” expertly balances darkness and beauty, building from heavy shoegaze with dreamy vocals half-buried in the mix to a menacing guitar noise freakout." Notes: "Hotelecaster are set to release their debut EP, Farther Fewer, at [hometown MPLS venue] Icehouse on Friday, February 27. They just released this brilliant Sims 4-sourced animated video for "Preset 3." The clip, conceived and put together by Madison's Aaron Yonda (creator of the Chad Vader video series), finds the animated versions of the members of the quartet making music and mischief throughout their simulated day, all set to the song's vibrant pulse." Notes: "For album number sixteen, Terraplane, Texas folk legend Steve Earle set out to make a blues record... As much as the blues are about instrumental virtuosity, Earle explicitly states that he was drawn to the genre for the songs themselves: Robert Johnson’s metaphysical ruminations, or Howlin’ Wolf’s juke-joint explosions. Earle himself is not the best guitar player, but he has a feel for atmosphere that a shredding blues solo can’t touch. In our Studio 1A, Earle stripped down several Terraplane songs to their acoustic core. On “King Of The Blues,” he revels in the dark side inherent in so much of the blues tradition." I got the chance to see Steve live last week - and get my pic w/ him! That's two generations of Earle!! Notes: "Nikhil P. Yerawadekar’s musical philosophy: to enjoy himself with a carefree attitude towards the industry powers that be. While many claim this ethos, listening to the Low Mentality’s laid back, almost indefinable style, you get the sense that they really mean it. Yerawadekar and his band deliver unselfconscious, funky Afropop beats influenced by the multi-instrumentalist’s childhood in Queens, NY. Now based in Brooklyn, Yerawadekar earned his Afrobeat chops in bands like Akoya and Antibalas..."
Notes: "Break out the Justin Vernon family tree! Aero Flynn is the project of Josh Scott, a musician whose old band Amateur Love shared members with Vernon’s old band, DeYarmond Edison, more than a decade ago... Now based in Minneapolis, he’s assembled a touring lineup and is about to release a self-titled album as Aero Flynn. Lead single “Dk/Pi” sounds extremely promising; it reminds me of Radiohead’s “Weird Fishes (Arpeggi)” or a krautrock version of the second Bon Iver LP. " Notes: "[Parisian] Dom La Nena sings barely above a whisper though her melodies can penetrate the darkest heart. On "Llegaré" (I'll Get There), from her CD from Soyo, she collaborates with former Los Hermanos member Marcelo Camelo, elaborating on her chamber folk sound." It's Dom La Nena's fourth time on PUTV! Notes: "In 2012, Seattle’s THEESatisfaction released awE naturalE, an album that seamlessly blended R&B, hip-hop, and electronic music. Now, the duo comprised of rapper Stasia “Stas” Irons and singer Catherine “Cat” Harris-White has announced its follow-up, EarthEE... out February 24th, 2015 via Sub Pop, the 13-track effort boasts a bevy of collaborators, including Shabazz Palaces, Porter Ray, Meshell Ndegeocello, and Taylor Brown, among others." We first heard the Seattle duo back on Episode004 - as we had lots of early PUTV artists coming back this week with awesome new music! Check out what appears to be @MyMorningJacket's new single "Big Decisions"
#IFPI CEO Frances Moore on global release day: "People have to accept change" - Friday to be record release day! Saw Ben Gibbard of @dcfc this week at the @SkypeLiveStudio!